Submitted by witness on Monday, November 1, 2010. LOCATION DETAILS: The lake is around a mile down off the main road. It is near the Wva, Va line. It is the reservoir for the City of Harrisonburg. OBSERVED: My cousins and I were kayak fishing on Switzer Lake in Va. We had been out for around an hour or so when we heard a knocking sound coming from the bank. We paddled a little closer and it stopped. I started to hit the side of the kayak with my paddle and the knocking answered. We did this back and forth for several minutes until it stopped answering back. The area the knocking was coming from was very steep and would be hard for a person to get to. OTHER STORIES: Yes. 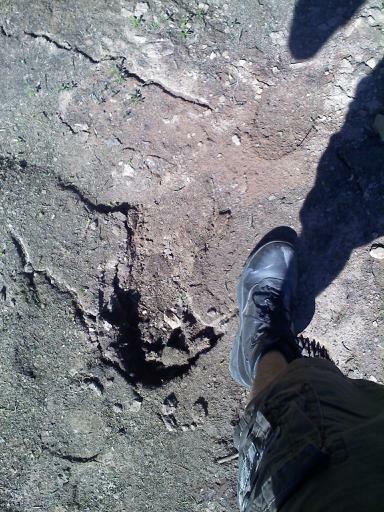 The cousin that I was with went back to the Lake with his dad to fish and found what looks like a foot print in the mud. He took a picture that I would like for you all to look at. TIME AND CONDITIONS: 11 am. Bright sunny day, wind was calm. ENVIRONMENT: A lake in the mountains surrounded by thick woods and a steep bank on one side. After hearing wood knocks from the forest, TB and his cousin paddled their kayaks to within 15 yards of the shore. He banged the side of his kayak with his paddle and heard wood knocks, seemingly in response. He knocked back and the knocks repeated. This interaction went on for a few more iterations until finally the knocks from shore ceased. He and his cousin loitered in the area, watching for someone in the forest or along the shoreline, but saw no one. The incident took place along the steep and forested southeast shoreline south of the "dog leg" where the lake bends in a southerly direction. The knocks originated from somewhere up slope, in the forest, and not at water level on the shore line. TB has walked around most of the lake but was not aware of a trail completely encircling the lake, believing the steepest areas may prevent it. At the time there were just four vehicles in the parking lot, including his own, and he had seen enough other fisherman to feel as though all people in the area were accounted for. At the end of our conversation, TB mentioned something that he did not put into his initial report. He lives about 15 miles away from lake Switzer and on one evening in October 2010 he was outside and heard a howl. It was unlike any of the coyote howls normally heard in the area, and dogs seemed to be stirred up by it. Cows in the area seemed to be panicked by the howl, and were making their own noises as well. The very next night his father was outside the house and heard a howl that he described as similar to what TB heard. I encouraged TB to try and record the howls with his camcorder if they should return. The area of this encounter is a heavily forested, mountainous and sparsely populated region of the George Washington National Forest. It has abundant natural resources and heavy cover that creates habitat often associated with the sasquatch. The weekend following this wood knocking incident, the witness's cousin returned to Switzer Lake and photographed this possible foot impression.